Anyone who wants to climb at Eika sports centre must read and sign a disclaimer form. You can get these from reception, and must be signed and delivered back before you have access to the facility. We will store your disclaimer form. Everyone is allowed to boulder. Do not climb beneath others who are bouldering. It is your responsibilty that no-one falls on top of you. Everyone is allowed to climb (but not to secure) using ropes on all walls. If you don't have the top-rope climbing card, you can train to secure yourself with a rope up to the second bolt. Climbers must descend after the second bolt. You must be 16 or older and have signed a disclaimer form. It is your own responsibilty that you are able to check your own equipment, give the correct buddy check and secure yourself safely to the wall. Top-rope card and similar mean you are able to climb secured to the top-rope on all walls. The card should be visible in the seal as you climb. Lead cards (Ledkort/brattkort) and similar allow you to secure yourself by lead to all walls. The card should be visible in the seal as you climb. You are allowed to guide one person who is not qualified at a time if you have a top-rope card (only top-rope) or a lead-card (top-rope and lead). Whoever is supervising is responsible that this is done in a safe way. 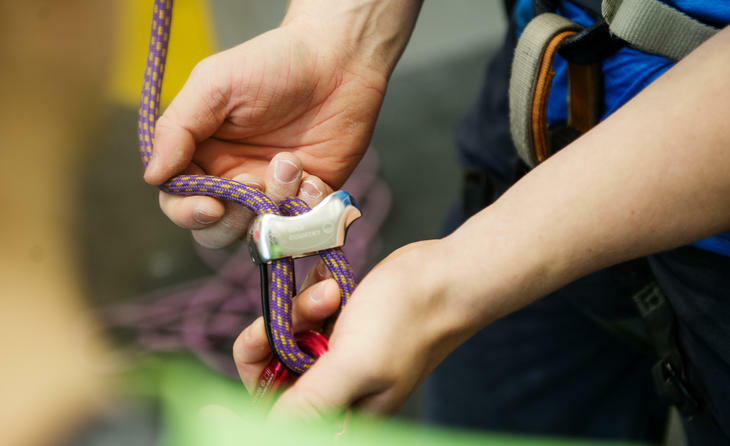 The guide should be on the ground, have complete focus on safety and keep hold of the rope at all times. You must not secure others at the same time. Any kind of paid instruction taking place at the facility can only happen with prior agreement of Eika Sportssenter. Staff can direct climbers to bouldering and confiscate security cards if anyone is not secured properly.